The Sylvan Heights fish was made possible by the generous support of North Carolina’s Touchstone Energy Cooperatives, Halifax Electric Membership Corporation and Roanoke Electric Cooperative. Electric cooperatives provide reliable, safe and affordable energy and related services to more than 950,000 households and businesses, serving more than 2.5 million people, in 93 of the state’s 100 counties from the Blue Ridge Mountains to the Outer Banks. Each of the 26 electric cooperatives is governed by a board of directors elected from its membership, and members are also owners. They emphasize the importance of community involvement, integrity, accountability and innovation. That emphasis was shown in sponsoring the rockfish for Sylvan Heights. Local artist Napolean Hill painted the fish, mimicking the colors and patterns of a Peacock Bass, a fish that is aptly named for a peacock due to the spot on its tail that looks like the eyes on a peacock’s feathers. On the side of the fish, the Sylvan Heights staff asked him to paint Red-Breasted Geese, out of all the birds in the park, because Mike Lubbock once looked after the Queen of England’s geese. 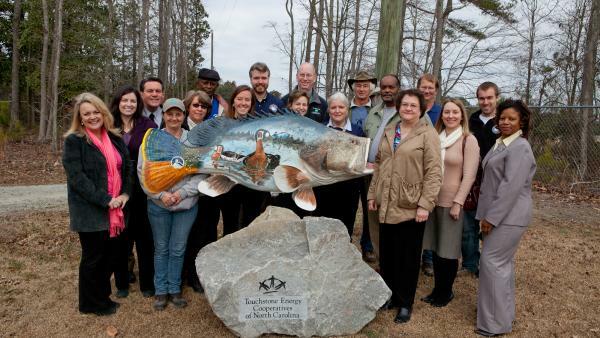 This fish was truly a community effort!The Sylvan Heights fish was made possible by the generous support of North Carolina’s Touchstone Energy Cooperatives, Halifax Electric Membership Corporation and Roanoke Electric Cooperative. Electric cooperatives provide reliable, safe and affordable energy and related services to more than 950,000 households and businesses, serving more than 2.5 million people, in 93 of the state’s 100 counties from the Blue Ridge Mountains to the Outer Banks. Each of the 26 electric cooperatives is governed by a board of directors elected from its membership, and members are also owners. They emphasize the importance of community involvement, integrity, accountability and innovation. That emphasis was shown in sponsoring the rockfish for Sylvan Heights.